If you’re looking for an all-natural beauty product that will do just about anything, look no further than apple cider vinegar. Used for centuries, it is made by adding bacteria and yeast to juiced apples, then fermented into a golden elixir. The finished product does wonders for your hair and skin. 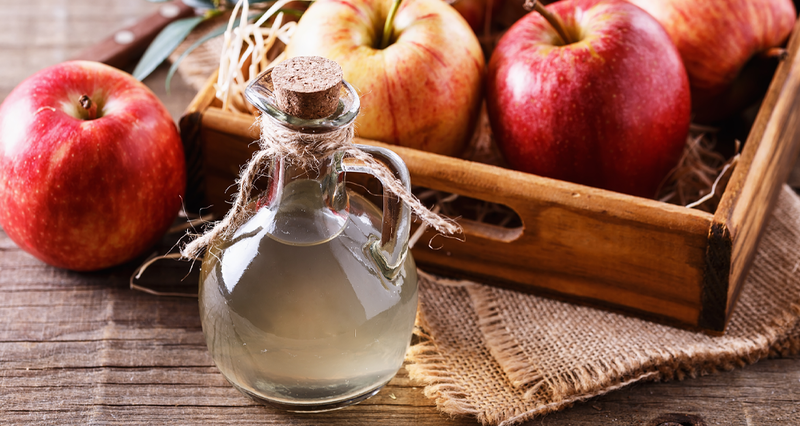 You must use raw, organic, unfiltered apple cider vinegar that has the “mother,” the proteins, enzymes and friendly bacteria responsible for its cloudy appearance. Pasteurizing kills the nutrients that allow it to work its magic. For shinier and healthier hair, after shampooing, use 2 tablespoons apple cider vinegar in a large cup of water as a hair rinse to dissolve product buildup. Rinse, then condition the ends only. Once a week, rinse your hair with half water, half apple cider vinegar to fight dandruff. Massage it into your scalp and leave on for 15 minutes before rinsing with water. The vinegar’s anti-fungal properties stop dandruff from forming. Apple cider vinegar contains alpha-hydroxy acids and acetic acid making it a natural astringent. Mix one tablespoon with two cups of water to exfoliate, stimulate blood flow and minimize the appearance of pores. Fight and prevent acne by cleaning trouble spots with a dampened cotton ball. Its antibacterial, antifungal and antiviral properties fight bacteria and balances your skin’s pH level. Draw out toxins by making an acne face mask. Mix equal parts apple cider vinegar and bentonite clay. Apply, let dry, then wash off. To soften the skin on your body, pour a cup of vinegar into your bath water and soak for 20 minutes. Soothe sunburn by mixing a half cup of apple cider vinegar in four cups of water. Soak a towel in it and apply to where you are burned. The vinegar has powerful anti-inflammatory properties that will help heal your skin by balancing the pH level which will minimize peeling, reduce redness and reverse sun damage. Whole body burned? Soak in a tub with a cup of vinegar. Banish bad breath and kill bacteria in your mouth by gargling with 1-part apple cider vinegar and 2-parts water. Whiten teeth by gargling with a half teaspoon vinegar in a cup of water before brushing in the morning. Can’t stand the smell of vinegar? Don’t worry – it goes away in just a few minutes so revamp your beauty routine with budget-friendly apple cider vinegar! The finished product does wonders for your hair and skin.